Big Data or The Right Data? The Big Data revolution has hit the healthcare industry, yet many health systems still suffer from a small data problem. 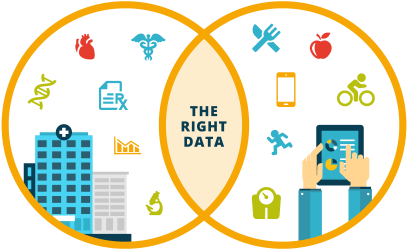 With petabytes of data in the EHR and data warehouses – little is known about the patient, what’s important to them, or the information that will ultimately drive health behaviors, outcomes, and value over time. That’s where we can help. Understanding your population is a science. For the past 15+ years, we’ve helped refine the science of population health through research and other outcomes-driven initiatives. Now, our evidence-based approach helps power population health management initiatives in the new value-based healthcare model. Our approach is to enable providers to build a longitudinal view of patient health, through new data streams. Monitoring and identifying health risks through assessments and risk screeners is the first step to improving the outcomes of your population. Providing results back in real-time will empower them to make informed decisions and become partners in their health. Use ongoing health data to identify risks, at the population and individual level. Grouping patients based on risk-levels enables healthcare providers to move from a one-size-fits all to a highly personalized approach. Incorporate patient preferences to personalize care to the individual to help improve adherence and success. Examples of implementing interventions into the continuum of care include: Health and Wellness Programs, Health Risk Management, Care Coordination and Disease Management. Use data to identify what worked and what needs improvement. Refine the process. Repeat. Our solutions help you get the health data you need to deliver superior care, without additional burden to your clinical staff. Layer new patient-centered technology on top of the EHR to engage patients, demonstrate value and maximize reimbursement. Develop a longitudinal picture of population health by supplementing EHR data with insights into patient lives outside of the clinic. Health researchers improve outcomes with technology that automates data collection and is built for the complexities of today’s health research.